When it comes to attracting women, what you don’t SAY matters! Communication is the most important factor when it comes to attracting women. 90% of our communication is done through body language, not words. What this means is that mastering proper body language is a powerful tool that can be used to improve your success rate with women. Most body language isn’t interpreted consciously, yet it still triggers irresistible feelings of attraction in women by influencing the limbic brain: the part of the brain responsible for emotions such as lust and attraction. By using proper body language, you communicate directly with this system and increase her responsiveness to your advances. According to Psychology Today, your persuasion strategy should focus on making her comfortable, getting her to like you, and getting her to let her guard down. If you want a girl to fall for you, understanding and using the flirting cues below can help you attract her with body language. Tone of voice is a combination of spoken language and body language, and there are many different ways to adjust your voice that will either help or hinder your efforts to attract women. According to Askmen.com, the way you speak your words is more important than the words themselves. You should speak your words at a regular pace and in an assured, resonant tone. Talking too fast makes you seem nervous, and you may not even be heard. Talking with a whispery or nasally voice is unattractive and can be interpreted as a sign of low confidence. Additionally, if you want to take things up a notch, here’s a great way to create sexual attraction with a woman using your voice. Smiling communicates availability and approachability. How perfect a smile looks is not as important as the act itself. Research shows that women respond to the act of smiling rather than the whiteness of your teeth or the shape of the smile, so don’t fret it if your teeth aren’t perfectly aligned. Smiling is also infectious. By showing that you feel good through a smile, you can trigger the same feeling in a woman, and she’ll associate “feeling good” with being around you. The attributes you want to communicate using your posture are dominance, confidence, and approachability. Always keep your back straight and your shoulders squared. When standing, plant your feet at least shoulder width apart. This posture is subconsciously interpreted as a sign of fertility and youth, attributes which the human body has evolved to seek out in mates. Keep your hands free at your sides and preferably with your palms open as opposed to crossed at your chest. The latter posture makes you seem nervous and closed off. Lean forward towards the woman you are talking to as this portrays desire and excitement and will subconsciously pull her toward you. Women find fidgety and jerky movement unattractive, because it is a sign of nervousness. Slow, assured movements signal confidence, the ultimate tool in attracting women. Slowing down your movements portrays comfort in who you are and makes you more approachable. Numerous studies reveal a woman’s sense of smell is up to 100 times more powerful than a man’s. Also, there is a direct connection between a woman’s olfactory glands and her limbic system. By smelling good, you can exploit her limbic system, which we touched on at the beginning of this article, and get her to fall for you. Regular showers help eliminate unattractive body odors, but using deodorant and a touch of cologne takes your game a notch higher. During conversation, the use of well-timed and well-placed eye contact increases the connection between you and her. Avoid looking away for too long as this makes you look uncomfortable and nervous. It can also be taken as a sign of disinterest. Just remember not to gaze too long. Staring is creepy, but the right kind of eye contact triggers the release of chemicals that increase attraction in women. Body language is a dynamic process and should be adjusted based on the response of your female counterpart. By learning to read a woman’s “attraction signals”, you can engage the right non-verbal cue to remedy an unwanted situation or ramp things up a notch when things are going well. Some of the cues to look for include a flushed face and fast breathing. Also watch the positioning of her feet when you are together and what ScienceofPeople.com calls the “power of the purse’. If she keeps her feet facing you rather than towards an exit, chances are she is attracted to you. If she keeps her purse out of the way rather than between you, it’s a sign she is open to your advances. The extent to which body language counts in flirting is seldom noticed, but hard to ignore. 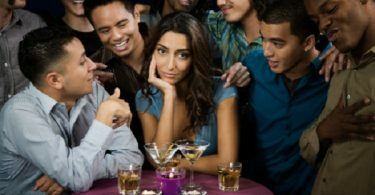 Even men who are very successful at attracting women are not always aware of what their body language reveals to her. These men tend to naturally exhibit confident body language that attracts women, while the rest of us have to work and study a little harder to get things right. The good news is, with a little practice, you too can learn to attract a woman with body language, until one day it becomes your natural way of presenting yourself.